It's July, summer has finally come to Geneva and, under normal circumstances, the thoughts of disarmament diplomats would now be turning to a few weeks of holidays before the Conference on Disarmament resumes again on July 28. This year, though, any such vacation plans have been dashed by three weeks of work to "negotiate a proposal" on cluster munitions, which began on Monday in Geneva, and one week of talks on the illicit trade in small arms and light weapons, which begin on Monday in New York. Negotiations on cluster munitions? I hear you ask; "hasn't that all been taken care of by those Dublin negotiations Disarmament Insight wrote so much about in May?" Well, yes and no. The Dublin Conference on cluster munitions, which was part of the stand-alone "Oslo Process," did agree a treaty banning cluster munitions, which was adopted by 111 States and is due to be signed in Oslo on 3 December. In parallel, however, States party to the Convention on Certain Conventional Weapons (CCW) - about two-thirds of which participated in the Dublin conference but which also includes some not in Dublin including the United States, Russia, China, India, Pakistan and Israel - are also engaged in an effort to negotiate a proposal on cluster munitions that would balance military with humanitarian concerns. The big question before the CCW meeting began on Monday was: How would States that had adopted the new Convention on Cluster Munitions (CCM) approach the negotiations, bearing in mind that the CCW negotiations had virtually no chance of setting the same high standards of international humanitarian law (IHL) as had been achieved in Dublin? The answer now seems apparent. These States - most of them at any rate - do not want to end up in the CCW with a Protocol developed in the CCW that would, in effect, countenance the further use of cluster munitions rather than stigmatizing them. Adopters of the new CCM want a CCW outcome on cluster munitions that complements their achievement in Dublin, not undermines it. Possible acceptable outcomes for these States could include a CCW Protocol that prohibits the transfer of all cluster munitions, or that prohibits the use of cluster munitions in or close to civilian areas. And a number of States and organisations raised concerns this week that suggested language for a new CCW Protocol on cluster munitions, as had been outlined in a Chair's paper, ran a real risk of rolling back existing IHL rather than building on it. These concerns were first raised in April (see our blog on 'Cherry picking at the CCW' for background) and again at this CCW meeting, partly stemming from the fact that the proposed text reiterated (in some cases with modifications) selected existing rules and principles of IHL, while remaining silent on others. "It is prohibited in all circumstances to make any military objective located within a concentration of civilians [or in areas normally inhabited by civilians] the object of attack using cluster munitions." Overall, the third session of the CCW negotiations got off to a sluggish start this week, with most negotiating sessions running well under their allotted time. Perhaps it has something to do with the hot and heavy weather and thoughts of squandered vacation time. More likely, though, it can be put down to the unfamiliar and downright awkward situation of trying to do something that has already been done very well elsewhere. It's hard to draw motivation from that. 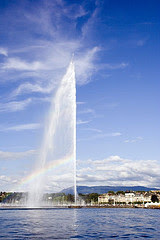 Photo Credit: Geneva's Jet d'Eau by neurosis on Flickr.